Below you can view all the homes for sale in the Coal Creek subdivision located in Golden Colorado. Listings in Coal Creek are updated daily from data we receive from the Denver multiple listing service. To learn more about any of these homes or to receive custom notifications when a new property is listed for sale in Coal Creek, give us a call at 720-580-6937. Mountain living at its finest! Showings begin Sat, 4/20 MLS#6744273. MOCK REALTY COMPANY. 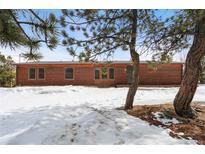 Incredible views, privacy, and yet a great commute to Boulder, Golden or downtown Denver. MLS#7787528. Redfin Corporation. Great owner occupied or investment rental property. SOLD AS IS. MLS#7525275. RE/MAX Alliance on Walnut. The home has direct TV cable avail. + fiber internet. MLS#7498618. Porchlight Real Estate Group. The seller will provide the well and septic tests. MLS#1711229. RE/MAX ALLIANCE. You will love the 6 Car detached garage for all your toys!! ! MLS#3843082. LIV Sotheby's International Realty.